We are making robots, maybe you also can. The walker on my previous post had a quite low performance on walking. 2 days ago, I have accidentally found 2 really cheap toy trains on my local market and bought them immediately. I have disassembled their gearboxes and worked out a connection with the walkman motors own gears. The result was a success. 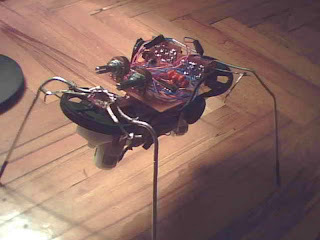 The attachment of the gears and legs, and the trimmings required to make it walk with its new heavy-duty legs took about 10-12 hours. Then I have worked on its obstacle sensors in order to make it reverse and go to another direction in order to prevent it from getting stuck. Finally I have made a simple head with flashing eyes to add some smooth personality. 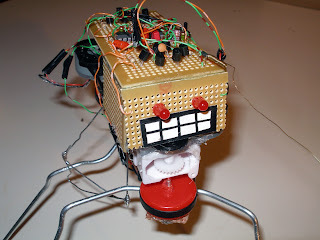 +In addition, I have done the connections required to attach a pic chip to the robot, to make it software controlled in near future. 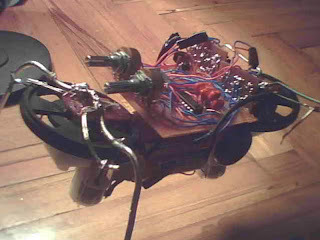 Made out from walkman motors (most would think its impossible to do a walker with them). 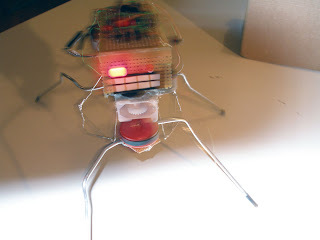 This walker has a photofobic behavior (it runs away from the light basically). This is a test video, I am still working on the gears to make it more efficent. More video and pic will be added soon. Here are the high res images and video of the robot on the previous post. This sunday we have started building a walker with a friend of mine. After a few days of work the body and main electronics are completed. Now it is only walking forward as a default movement, but next weekend we will install a pic chip to control the behaviors of the robot. 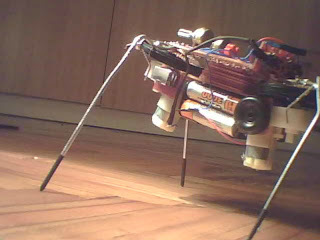 Sorry for the low photo and video quality, I will post better ones soon with the circuit and more info about the robot.